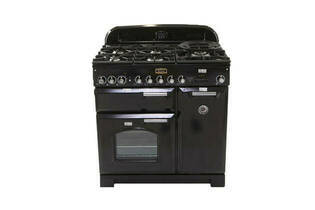 Oven, grill and cooktop performance are excellent. Cooktop layout is very good (simmer and wok burners at front). Grill element in separate grill compartment has a shield. Grill and oven shelves roll out smoothly and have stoppers. Has main oven, tall oven, and grill compartments. Enamel exterior is easy to clean. No shield over grill element in main compartment. No telescopic runners in main oven. Borderline visibility through small window in oven door. Catalytic liners provide only OK coverage. 19 Feb 2018, deborah c.